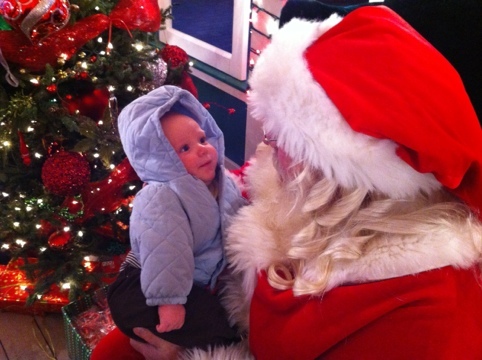 So we went with my sister (and the kids she nannies) to visit Santa at the mall yesterday. Grant had to work but I told him I’d take pictures and send them right to his phone so he could take part in experience. Except that didn’t work cause Santa is an extortionist. children? I guess the elves probably went on strike because they received so little wages for all the iPads and pods they’re making this Christmas. I mean, that is a lot of work. That may’ve forced the big man’s hand. Still, I’m not sure I can justify $16 for one measly non-digital copy of a photo of my son sitting on a big guy in a red suit (even for the elves). Only then I realize… He’s not even wearing the suit. No really. He’s dressed in a cheap looking green shirt and suspenders. Wow, all that holiday work must really be tiring him out if he can’t even manage to get dressed to meet kids. Oh but maybe Coke Cola has decided to copyright the suit and charge royalties on the use of the image. So we forgo capturing the memory and just let Bracko sit on the guy’s lap. Then he offers him a sucker. And by this point I’m finding every fault I can in this charitable holiday figure … He only has suckers. What about diabetic kids or kids too young for sugar? The best part of the whole thing was the 8yo girl my sister nannies. When Santa asked if shed been a good girl this year her face went as white as sheet. It was like she thought: “Oh crap. He really asks that question? !” After some cajoling she gave him a guilty sounding “yeah”. When questioned about it later she said she just wanted to be honest. Love that girl. 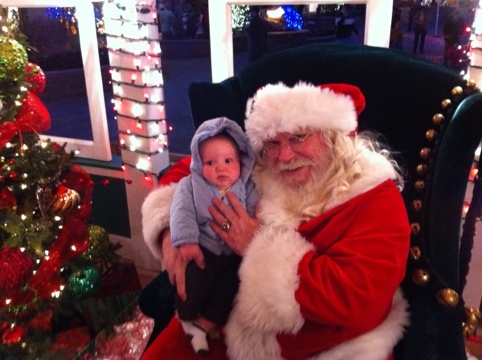 The day was well redeemed though when Grant was able to go with us to see the lights at the Riverwoods shopping center later that evening and there he was… The real Santa Claus. Red suit, no extortion, and toy rubber ducks as well as candy canes. Thanks Santa! “Well, forgive me, but I don’t want to see your naked breast,” I was told in disgusted tones by a close friend in reference to nursing in public. I can forgive this friend for her uninformed opinion, but I cannot forgive the society that produces such a negative attitude towards mothers. Here is the crux of my frustration. I am a new mother. 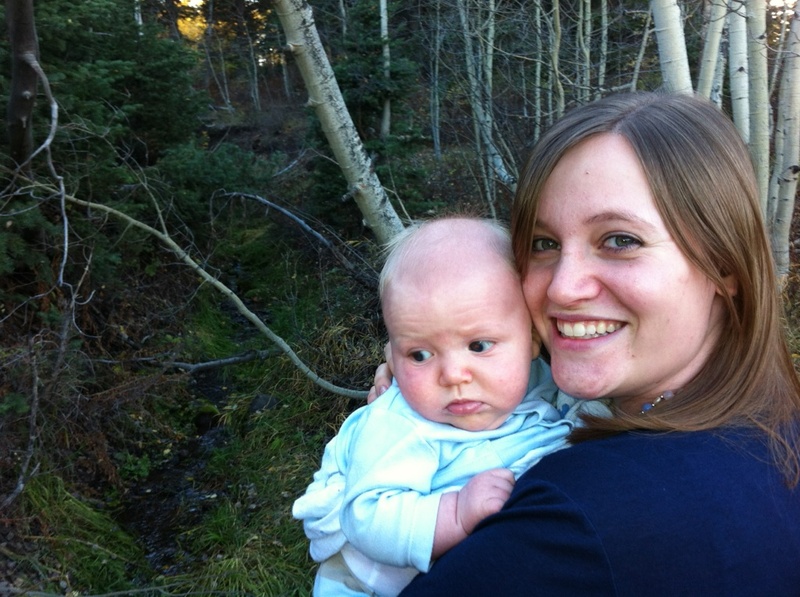 I spent months and months leading up to the birth of my first child researching how to be a good mother to him. The subject I was most anxious about in all my study was breastfeeding. I can give you an incredibly long list of websites and books that name the incredible and innumerable benefits of this natural method of feeding your infant. [To start with, here’s what the Le Leche League and the World Health Organization have to say]. There’s no question in anyone’s mind that where infants are concerned, breastfeeding is the way to go. I was so anxious to get this right, to establish the breastfeeding bond, to do what was right by my little guy, that I spent hours studying it while I was working and going to school full time. — and, to toot my own horn, I did it! 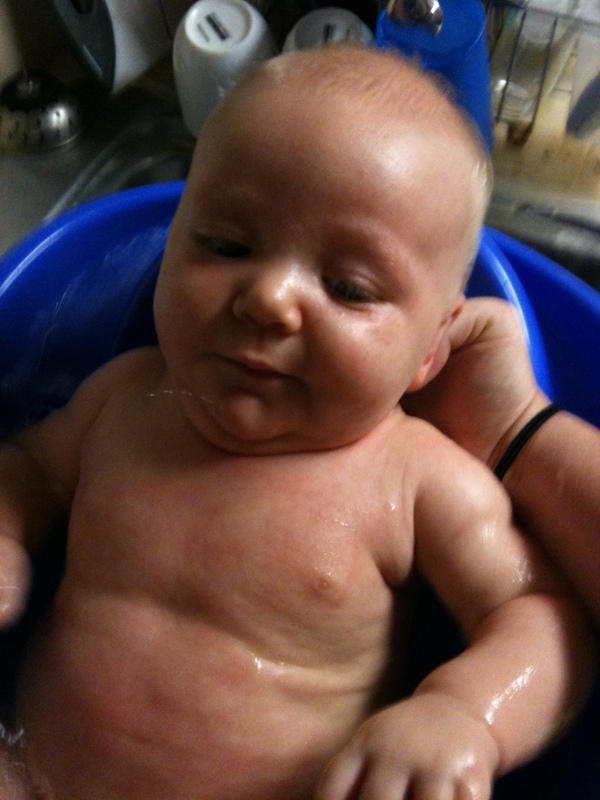 If there is anything I am doing right as a parent, it is the way I feed my little man and no one could argue with an almost 20 pound three month old. He is definitely benefiting in this regard. So can someone please explain to me why societal attitudes insist that I should be ashamed of this? At best, I am looked at curiously while I cover my baby with a blanket, like some kind of circus performer — at worst, I am angrily banished to a dirty public restroom (because nursing facilities are, if anything, rare in public places) because what I am doing is disgusting to the majority of regular citizens. They “don’t want their children to see that” or worse, they are afraid that what I am doing will excite some kind of sexual response. These attitudes frustrate me. Why is my choice to sustain life in the most natural of ways gross to most people? The WHO states that worldwide, less that 40% of mothers choose to breastfeed (and those few who do are banished to a box to do so). We now have a generation of adults who can not remember ever seeing a baby breastfeed. They’ve seen billboards of scantily-clad women, and after watching almost any pg-13 or R-rated movie they’ve heard or seen more innuendo than they have storyline, and they walk by women who put a great part of their bodies on display day after day with the motivation of being provocative … but a breastfeeding mother? Not so. That is unacceptable. It is this woman that they must hide away. We are not flashing you to be provocative or to make some kind of point. We are sustaining life; we are creating joy; we are furthering civilization. But we are wrong somehow. What we do is socially abhorrent. Yes, let’s hide this beautiful bond away cause it makes us uncomfortable. Infants who are breastfed eat 8-12 times a day for 10-20 minutes at each meal. Do your math folks. That is every 1-3 hours all day long (and all night). That measures start of feeding to start of feeding, not end to start, so that means you could feed your baby and 40 minutes later, he’ll be hungry again. Take a look at my child. This is quite often the case. — Are you going to banish a mother to another room every time she must feed her baby simply because it makes you uncomfortable? Think of how uncomfortable and embarrassed she must be to have to leave the conversation so often, just to feed her baby. Most infants don’t want to eat under a blanket. Why don’t you go around trying to eat a bowl of soup under a blanket everywhere you go and see how you like it? They want to look at their mommies. They want to see what is going on around them. Beastfeeding is most often so discreet, sans blanket, that most people don’t even notice what you are doing. It only takes a second to latch a baby on and after that your shirt and baby cover most of what is going on. It is often more obvious what you are doing when you have to go through the whole blanket or nursing cover routine. 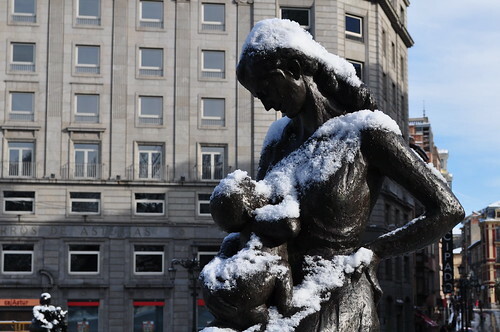 45 states have laws that specifically allow women to breastfeed in ANY public or private location and where there is no law, those women are protected from public indecency laws. So please consider your attitude towards mothers and children and whether it is fair and just. Are you uncomfortable being with someone who is breastfeeding their infant? Is that an incorrect attitude passed down from your culture and the lack of mothers who breastfeed in public because of these prejudices? Should you correct your feelings on the matter? I wish you could see what I see. Then you would realize how truly beautiful this is. The measure of any society or nation is how it treats its weakest members. Surely that includes children, and women who are handicapped when feeding their infant. Civil law is improving in its attitude towards this class of individuals. Are you?